Local traditions in popular music of the 19th Century were sometimes absorbed into a 'national' culture, creating stereotyped images. With the development of the railways movement across the country was made much easier. Performers could travel to different venues on 'tours' and music publishers could sell their works much more easily in distant towns thus, creating an awareness and an interest in regional variations. 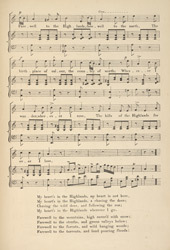 Lyrics like these in this song of straths and valleys, mountains covered in snow and deer running wildly, became typical images of Scotland.